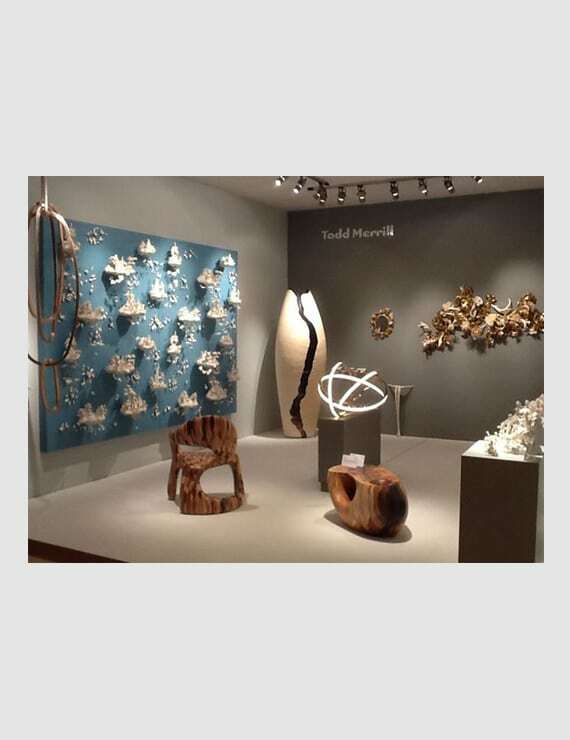 October 19TH – 25th, 2012 New York, NY—Todd Merrill is honored to be exhibiting for the first time at the International Fine Art and Antiques Dealers Show (IFAADS) at the Park Avenue Armory in New York, October 19 – 25, 2012. Merrill will show the best of his Studio Contemporary artists’ work alongside 20th Century design masterworks. Merrill’s booth will feature the creations of Jennifer Trask, Beth Katleman, Joseph Walsh, and Marc Fish. This fair will mark many firsts for Merrill and his Studio Contemporary program, including the introduction of a new catalogue for Jennifer Trask’s “Vestige” series. 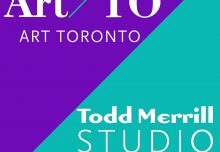 In keeping with the tradition of American studio arts Todd Merrill will show vintage masterworks by metal sculptor Paul Evans, including a highly desirable Forged- Steel Sculpted Console, a Massive Sculptural Studio Dining Table, and a 9’ Chrome Cityscape Sofa. The International Fine Art and Antiques Dealers Show will be the first time that Jennifer Trask’s most recent work from the “Vestige” series will be exhibited together. This includes “Burgeon” (2012), “Umi” (2012), “Undergrowth” (2012), “Tulipa 4” (2011), and “Chrysanthemum, Type 11” (2011). The artist’s wall and tabletop pieces are all hand craved from various animal bones, antlers, and teeth, as well 18th and 19th century gilt frame fragments. The most intricate is Trask’s monumental “Burgeon” wall sculpture, which contains 3,500 different pieces of animal bone and teeth. 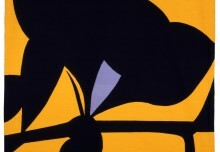 Of Trask’s work, Merrill has written, “Rarely have I encountered an artist who so completely creates through his or her work an alternate reality. Trask obsessively submerges herself in her art through both the words she chooses to describe it, and her constant research, like a medical alchemist, into the structures of plants and animals. She has created a visual poetry of beauty and science by reanimating bone and teeth, aged gilt carvings and all sorts of animal and plant detritus.” Past wall sculptures from this series in the permanent collection of the Museum of Arts and Design in New York and well as in an important private New York collection. A newly published catalogue of Trask’s “Vestige” series, with essays by Todd Merrill, Bella Neyman, and Bruce Helander, will be introduced at the IFAADS. This fair will also unveil the work of Marc Fish as part of Todd Merrill Studio Contemporary. On exhibit will be the artist’s “Mollusque” Low-table (2012), made of sycamore and copper, it is an oversized representation of displayed artifacts and stems from Fish’s exploration of the Victorian obsession with natural history. His work is highly sought after as Fish only makes one new piece per year. Fish is a renowned artist who began making furniture ten years ago in his studio and has gone on to win the prestigious Guild Marks by The Worshipful Company of Furniture Makers in Great Britain four times and was also awarded the Claxton Stevens prize in 2011, the highest honor bestowed by The Worshipful Company of Furniture Makers. 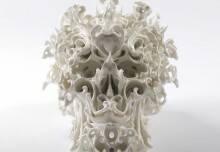 Visitors to the International Fine Arts and Antiques Dealers Show will have a unique opportunity to purchase Beth Katleman’s critically renowned and award-winning “Folly” but now in a size (11’ W x 7.5’ H) made for residential installation. Merrill will offer for the first time in the United States, Niamh Barry’s “Fouette II” chandelier/light installation (2012), Katsuyo Aoki’s “Labyrinth” (2012), a monumental porcelain horse sculpture, the first is in the collection of the Museum of Fine Arts in Houston (MFAH), and is sold exclusively through Todd Merrill Studio Contemporary and Joseph Walsh’s “Bord Na Ogma Desk and Chair (2003). Walsh was recently the subject of an article “Ahead of the Curves” in the Financial Times (October 6, 2012). Design journalist Helen Chislett wrote that Walsh “has taken the language of furniture and invented a whole new dialect.” She also compared the design and craftsmanship of his furniture to such masters of the American Studio Movement as Wendell Castle and Michael Coffey. Coffey’s work will be represented by a set of six rare American walnut stools (2007), each a unique sculptural work. 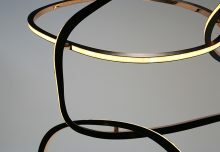 Merrill will also bring outstanding pieces by Paul Evans, a Forged- Steel Sculpted- Front Console, a Massive Sculptural Studio Dining Table, and a 9’ Chrome Cityscape Sofa. The Dining Table, model PE 21 done by Paul Evans Studio for Directional at the outset of their representation. It was marketed as the “Double Bow-tie.” Large Studio sculptural tables of this genre are quite rare – this is the second documented PE 21 to come to market in the past 10 years. This base at nearly six feet long, is in welded steel and with braised bronze decoration is comprised of one oversized double pyramid flanked by two supporting pyramids, all turned on their sides giving this sculptural base great mass with remarkable grace. Todd Merrill 20th Century and Studio Contemporary (www.merrillantiques.com and www.studiocontemporary.com) is known for showing the best of twentieth century and contemporary design. The gallery is located at 65 Bleecker Street in New York City. Merrill, a third generation dealer, opened his business in 2000 and quickly became known for a selection of the best of post-war American studio and custom furniture, as well as outstanding European 20th-century furniture and lighting. In November 2008, Rizzoli published Merrill’s book, Modern Americana: Studio Furniture from High Craft to High Glam, the first definitive book on late 20th Century American studio furniture. A year later, in 2009, Merrill launched Studio Contemporary to represent studio artists producing the best contemporary furniture and decorative arts.